You’ve been with a company for a few years and are starting to truly enjoy the stability you have and the relationships you’ve been. Then, a lawsuit emerges and the future of the company is in limbo. Your pulse quickens when you first hear the news in a meeting. Afterward, you look around the office and you see a collective sense of dread building among your coworkers. The calm that you’d grown to love is now gone and one thing grips you: fear. This, says HeraldPR founder Jude Englemayer, is exactly what happened to an international company named TransPerfect Global between 2015 and 2018. With more than 4,700 employees and 100 offices around the globe, TransPerfect was a formidable company. Fear prevailed as news of a legal battle for the company spread through the ranks, Englemayer said. At this point, the company’s employees had a decision to make. Would they let fear dictate their choices, or would they dictate their choices regardless of how afraid they were? Englemayer said TransPerfect’s employees banded together, formed an advocacy group and worked even harder than they were before fear set in. In a general sense, the employees at TransPerfect refused to let the unknown dictate their demeanor and tenacity. If anything, they used that fear to strengthen their intrapersonal bonds and work harder. These are just two ways you can leverage fear in the workplace, though. In many cases, new circumstances create fear. You get a new boss. You get a promotion. You’re up for a performance review. All of these can create fear, says Katie Ziskind, a marriage and family therapist based in Connecticut. That fear, however, doesn’t have to be a negative presence. These new situations test your mettle and force you to draw on your inner strength to move beyond a fear-based paralysis and into success, much like the earlier example of the employees at TransPerfect. “Look at your fear and situation as a challenge that is manageable,” she said. Courage is the ability to move forward with a goal or task despite the great fear those goals or tasks create. You look past the risk, the turmoil and the uncertainty. And courage, says Halelly Azulay, CEO of TalentGrow, is one of the beautiful side effects of tackling fear. However, it’s an underrepresented quality in the workplace. The absolute worst thing you can do with the fear you feel about your job is to let it dictate how you make choices. 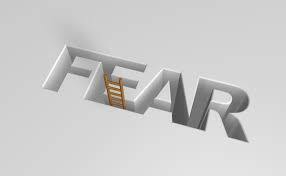 When we view fear as a negative presence, we miss out on its potential. Yes, fear can be a good thing in the workplace. In the short-term, the stress hormones released amid your fear of your future at your company is a good thing because it spurs you to work harder. However, if that fear is present for the long-term, it can have a corrosive effect, said Brooke Sprowle, a licensed clinical social worker and founder of My LA Therapy. So, while fear can be a tool that you use to excel in the workplace, you have to remember that the stress fear creates cannot be a constant; it should only be seasonal. This should lead you to some honest questions about your job. Ask yourself: Is this fear I’m feeling based on circumstances that will change at some point in the future, or is this just the normal day-to-day environment of this position? A little fear is good, Sprowle said, but working in an environment of constant fear – and, therefore, constant stress – can be detrimental. “Too much fear isn’t a job enhancer but a little can be,” she said.